On Friday, I and about a thousand other people took the day off to spend it at Alverno College where the state's Joint Finance Committee was holding their second day of public listening session. When I arrived at about 11 am, the crowd was so big that it led out of the building all the way to the street. As people trickled out of the building, they would let people in in small groups. It took about an hour to get in the door and registered to speak. Even with all of these people, it was very calm and orderly. I don't believe that it had anything to do with the score of police officers that were present. It is just that the citizens continued to be the adults in the room. This left Alberta Darling with nothing to gripe about except that people would show their pleasure and displeasure by holding up different colored sheets of papers. And after Darling insulted the citizenry, saying that they were being rude for this, people started admonishing her for her childish complaint. The topics that people addressed to the committee were pretty much the same as the previous hearing at the first hearing, such as the cuts to the UW system, to public schools, laws that would damage the environment and the privatization of long term care for the elderly and disabled. Even though it was spring break, there was a considerable presence from UW students that stayed in Wisconsin to address the proposed cuts to their schools. They pointed out that the cuts would make the schools less attractive to students and increase the brain drain that Wisconsin is going through. Senior citizens, people with disabilities and their caretakers shared the importance of programs like Family Care and IRIS, which are the only things keeping these vulnerable citizens from being forced out of their own homes and into nursing homes. Big business was represented too. Members of the MMAC were there to plug for the hundreds of millions to build a new arena in Milwaukee, claiming that it was a "quality of life" issue. This was met with derision and comments by the group pushing for actual quality of life issues like a decent education system or the programs that help our most vulnerable citizens. Another corporate faction that was present were the parties that wanted to privatize so many important programs in the state. One example would be that there were no less than three major for-profit insurance companies that were salivating over the chance to get a no bid contract for the $3 billion meant to help the disabled and the elderly. As State Senator Chris Larson points out on his Facebook page, can you imagine what the reaction would be if the Milwaukee Public Schools pulled kids out of class to pander to the committee for more money? The right wing squawkers and propagandists would be foaming at the mouth for weeks in their faux outrage. It would undoubtedly make it to the national level as Faux News, Drudge and Breitbart all clutched their pearls and fell back on their fainting couches at the abuse of tax dollars. Yeah, but even though the brainwashing education of these children are also being funded by taxpayers, don't hold your breath for any of the right wingers to say even one word about this. That would require integrity and intellectual honesty, things that they are clearly lacking. where are you big mouthed blaska? It's not his mouth that is big, have you looked at the orifice at the other end and the massive amount of cushioning there? Why isn't the MMAC simply opening their wallet and funding the balance for the arena if it is so important to them? Instead they just send Tim Sheehy to take a spot away from a real citizen? Ed- Because they wouldn't be Wisconsin businessmen if they took risks and paid for something themselves, now would they? And you wonder why this state keeps lagging, especially with the right-wing lackeys the MMAC and their mouthpieces at the Journal-Sentinel help to elect? 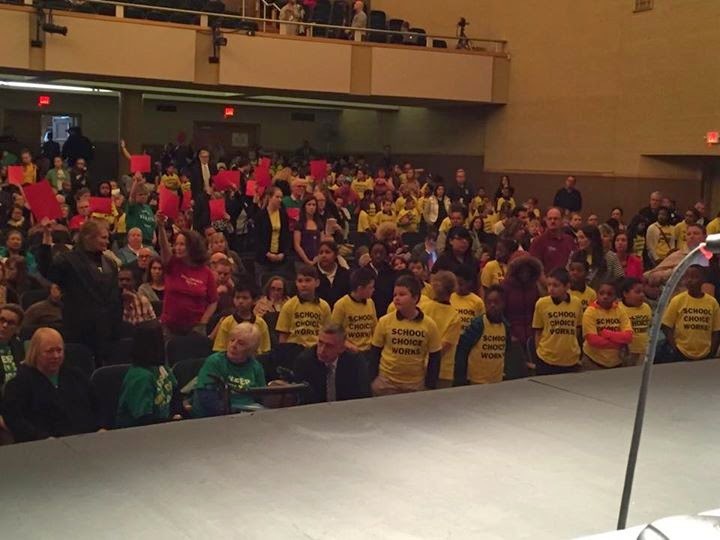 Actually, if any of those kids in the photo are taxpayer funded voucher students, their teachers should be fired. Why blame their teachers? The teachers doubtless had no vote nor voice in the decision to send the students. The school administrators, now — or why not simply penalize the schools as businesses for so using the children entrusted to them? Make damn sure that you're listening. At the twilight's last gleaming. 'Cause pa-tri-ots are buying Were so gallantly streaming. (To object they don't dare). That our flag was still there. With liberty and justice for — well, hell, so it's not a democracy. Get used to it. I would add the rant from David Weingrod, a satire production on his "approval" of Walker's budget and how he is hoping to get something of the billions in tax money that await successful private school applicants - biggest cheer and applause of the hearing through 4:30.